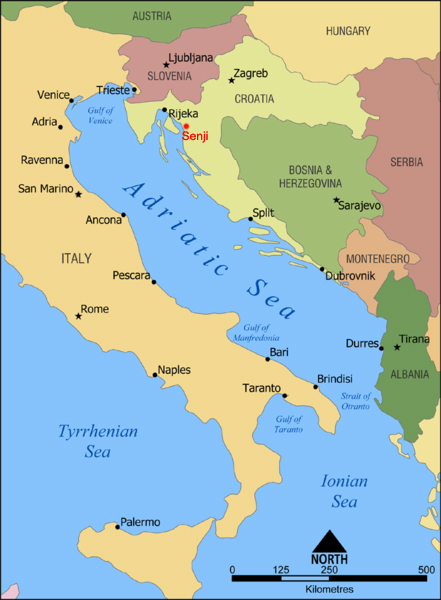 On the Balkan coast, across the Adriatic Sea from northern Italy lies a seaside town called Senji (Segna) that was once the stonghold of bloodthirsty pirates and high-sea kidnappers called the Uskoks. Map. The latter half of the sixteenth century and the first few decades of the seventeenth were their glory days. Their techniques were similar to Vikings since they prefered raiding in fleets of small boats that could melt into the swamps and estuaries of the coast where the large Venetian and Turkish ships couldn't follow. 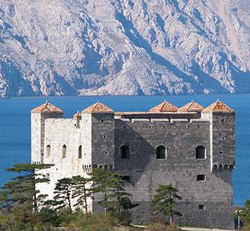 The Uskok fortress at Senj today. At first, the fortress of Klis was their hideout. But later, a few hundred of them settled in the coastal town of Senj. This location was well protected on all sides, by forests and mountains. Interestingly, despite their home in these Slav lands, the Uskoks weren't all Slavs. As their fame spread throughout Europe, adventure-seekers and other outlaws from a other countries came to join them. It is told that even a few English gentlemen joined their ranks! Their name derives from the South Slav word for "to jump in," but it has come to mean something more like turncoat or traitor.The Uskoks started out as a band of renegades, deserters from the Turkish armies in the territory of Bosnia and Herzegovina before they settled on the Adriatic coast. This area was poor in farmland and the people had few resources to export. They were encouraged to settle here by the Austrians who wanted a buffer colony on the coast to reduce attacks on Austrian ships. In addition to giving the Uskoks land, they also promised them an annual stipend to help support their navy. 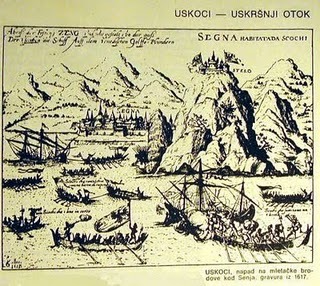 When the promised funds were not delivered, the Uskoks took to the sea and stole what was needed to support themselves. the islands along the coast of the Adriatic. And though they started out attacking the Turks, their sworn enemy, after about 1566 they turned their piracy on all ships in the Adriatic. The sea lanes were busy with commerce between Venice, Naples, Greece, Crete, Palastine,and Eqypt. Venice was a major port for all manner of goods coming into Europe from the East and the pirates of Senji found the heavy, slow-moving merchant ships easy-prey. They made life difficult for the Venetians, in particular. Why didn't the Venetians or the Turks just wipe out this small but hardy band of freebooters? One answer is geopolitics: Austria still supported the Uskoks because the pirates preyed on two of Austria's rivals, the Venetians and the Ottomans. Uskok dress in the 16th century. So for several decades shipping was fraught with danger on the Adriatic as the Uskoks overtook Venetian and Turkish naval ships. They continued to pillage the seas until 1617, when by the Peace of Madrid Venice and the Austrians agreed to root out the Uskoks. Several of the pirates were hung and beheaded, and the rest were resettled, but nobody knows with absolute certainty where. There are towns with Uskok-related names right on the Croatian-Slovenian border north of the city of Karlovac. Some Uskoks may have also ended up in Istria, where Mt. Ucka--the backyard of the resort town of Opatija--may also recollect their name. 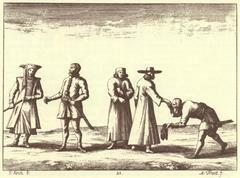 Artist rendering of Uskok Pirates. Like any worthy pirates, even after the Uskoks died out, legends about them lived on. There are many folksongs and poems in Croatian telling their stories. For instance, it was for a long time believed that the intense winds around were Senj were the Uskoks' mysterious doing: supposedly the pirates knew how to light a fire in a certain mountain cave and thereby raise a gale out in the Gulf of Kvarner that no vessel could survive. These sort of tales have continued to capture imaginations into the present time. A Uskok pirate costume would include a Venetian Hat or a wide brimmed hat like the Leather Fold-Up Hat adorned with a brooch and feathers, a Country Tunic worn over a white Pirate Shirt. Wear a Turban as a sash to hold your Pirate Cutlass. For the legs wear knee-high socks and black Knee Breeches with red ties or garters above the calf. The shoes can be black slippers like the Men's Canvas Shoes. Finally, a Vizer's Coat to top it off with flair and style. They wore their hair short and sported broad, twirled mustaches and the occasional beard. If you want to add this article to your list of favorites or email it to a friend, please use this permanent URL, https://stores.renstore.com/-strse-template/1106A/Page.bok. Permission is granted by the author to quote from this page or use it in handouts as long as you include a link back to Renstore.com.